Before we learned that 32-year-old Heather Heyer was the woman killed in a horrifying attack on anti-racist protesters in Charlottesville, Virginia, we learned the name of the man allegedly behind the wheel of the car that struck her: James A. Fields. That news broke on Twitter, and in the vanishing window of time before media outlets confirmed it in clipped, one-paragraph reports, anybody who Googled “James A. Fields” was directed to information about James Apostle Fields, a lawyer who died in 1903. 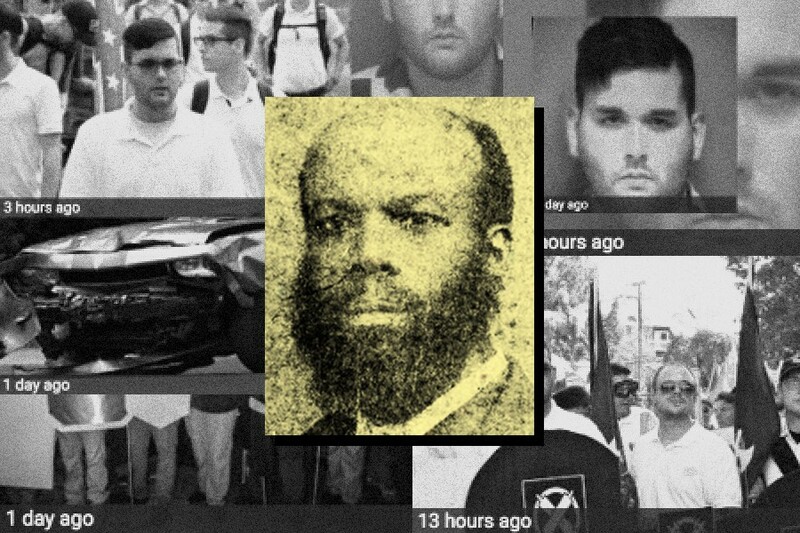 That in itself wouldn’t be so strange — “James” and “Fields” are common as American names go — but the connection runs deeper: Heyer was murdered for challenging white supremacists who want Charlottesville to preserve a monument to the Confederate general Robert E. Lee, while James Apostle Fields was a Virginian slave who escaped his owner during the Civil War, going on to earn his law degree from Howard University and serve in the Virginia House of Delegates (as a Republican). After he passed away, his home and law office became what was likely the first African-American hospital in the city of Newport News. The James A. Fields house is now a historic landmark. Well, try Googling “James A. Fields” today. On the first page of results, there is just a single link to information on the legislator and teacher who rallied with other black leaders in 1889 to condemn racist election fraud and disenfranchisement in the post-Reconstruction era (and, fortunately, a new Washington Post column about his life). The rest of the results concern James Alex Fields, the 20-year-old white extremist charged with second-degree murder in Charlottesville: how he couldn’t hack basic training for the U.S. Army, the extremist views he discussed with a high school teacher, his appearances elsewhere during the hate rally, and a profusion of the “what you need to know” bullet points that we’ve come to expect whenever some unknown young man commits mass murder or an act of terrorism. Also, over and over: his mugshot. Is Google’s algorithm doing something wrong? Not exactly. People are looking for this news. Yet it’s vexing to see an inspirational figure of American progress shunted aside for a guy who exemplifies American regression. Part of the problem is living in the future: Already, we have a hundred times as much granular data on the latter-day Fields as we do on his 19th-century namesake — we can’t even say for sure what year that man was born, or when he learned to read. Meanwhile, we can pore over the living Fields’ chilling Facebook posts and read an interview with his confused mother. And while James Apostle Fields merits no mention on Wikipedia, the Charlottesville suspect is the site’s top result for “James Fields” and will no doubt have his own article sooner than later. On top of all that, putting James Alex Fields Jr. in the digital spotlight touches a separate though related nerve. Reporters have long struggled with the repetition of a suspected killer’s name or the incessant use of their likeness, practices that parents of the victims, law enforcement, and academic experts have said can inspire more violence. Fields’ abrupt notoriety, then, is doubly unfortunate, serving to validate his actions as it further buries the legacy of a man who ought to be more famous, and who fought for racial justice in a segregated state, no less. It’s hard not to see the true power of whiteness in the way Google and the internet will now privilege a story of bigotry over resistance to it, including Heather Heyer’s heroic activism. As we dig into every detail of Fields’ past and follow his trial, trying to understand him, we expand a terrible archive. We study history in order not to repeat it, and so we cannot simply avert our gaze from Charlottesville. But we have met so many versions of James Alex Fields before. We have read up on their propensity for abuse, both verbal and physical — which is always excused because of their race — and the million ways they warned us aloud of their deadly intent. It does little good to rehash these prologues to slaughter when they’re utterly predictable and still don’t teach or convince us to prevent the next bloodshed. Maybe someday this familiar narrative will etch itself into the minds that refuse to acknowledge the pattern; surely we’ll continue to write it in that very hope. But with an internet that swallows decency like quicksand and exploits evil for a few moments of attention, it is no less our duty to ensure that what is noble in us remains on the page.